Forget about the red wine vinegar you get at the supermarket. Even the “good” stuff. Once you make your own red wine vinegar you’ll be spoiled for life. With higher acidity and a stronger, more robust flavor, homemade red wine vinegar will brighten and enhance any dish you use it in. 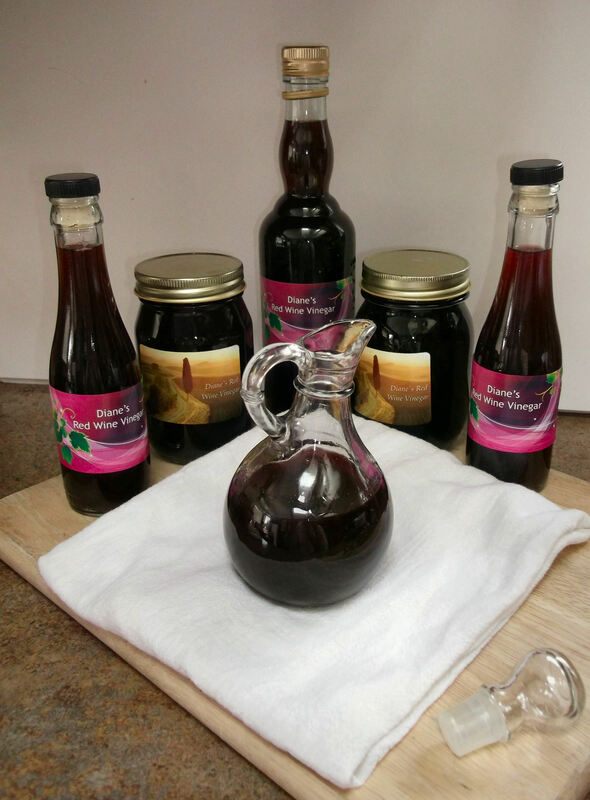 Several years ago a friend of mine got me started making my own red wine vinegar at home. It’s really very easy to do: The most difficult part of the process is waiting the 3 months for the batch to finish. But once it does, you will scour the internet looking for new ways to use it, because let’s face it: there’s only so much vinaigrette one household can use. 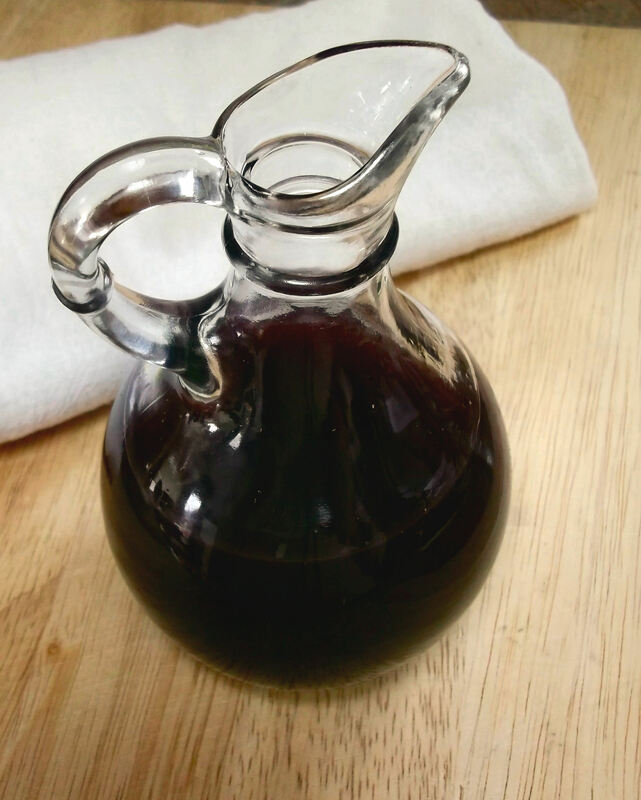 Making red wine vinegar is a great way to use up leftover wine (yeah, I know…like that really exists), wine that might have remained open a bit too long, or even a bottle of your less-than-favorite wine that a well-meaning houseguest gifted you. And if you don’t have wine at home, just go get a few boxes or bottles of the cheap stuff. 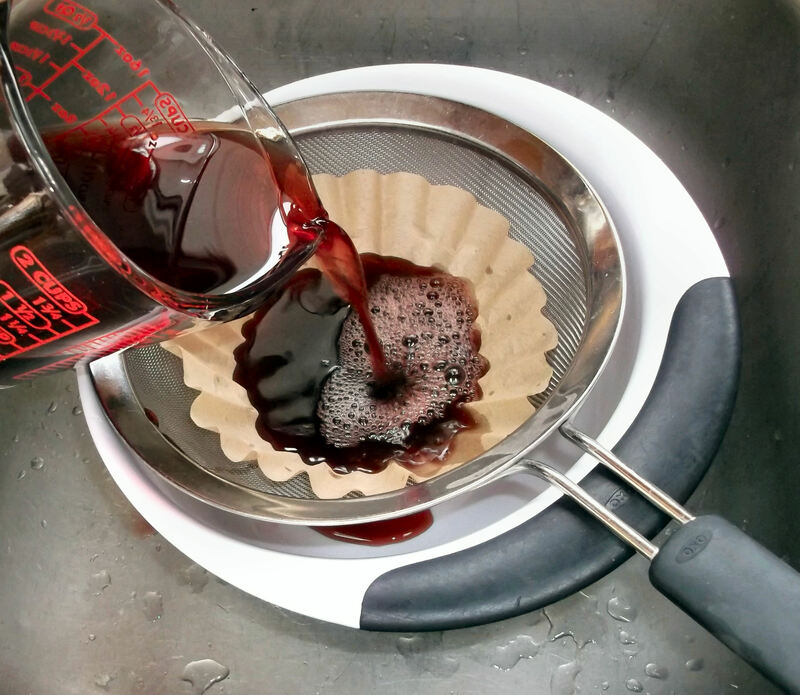 Mix and match different types of red wine: it will all contribute to a fabulous batch of vinegar. While it’s possible to make small batches – even just a few cups at a time – I make my vinegar in very large batches, and that’s what I’ve described here. Feel free to adjust quantities/container sizes according to your own needs. First, allow me to introduce you to Mother, known scientifically as Mycoderma aceti, a beneficial bacterium that transforms alcohol into vinegar. Yes, Mother looks and feels really, really gross. It’s slimy and icky, smells very strongly of vinegar and is really quite unappetizing. Once the vinegar is finished, Mother will have thickened and taken on a firmer – but still slippery – texture. As repulsive as Mother is to handle and look at, it is perfectly harmless – and likely even good for you – if ingested, so if you notice tiny bits of it in your finished product, don’t worry. The good news is that all of Mother’s disgusting-ness is easily forgiven once you taste the vinegar it makes! Clean the glass crock and place Mother in the bottom. If you have any leftover vinegar from a previous batch, add that as well. For that matter, if you have leftover Mother, like I do here, leave it all in. 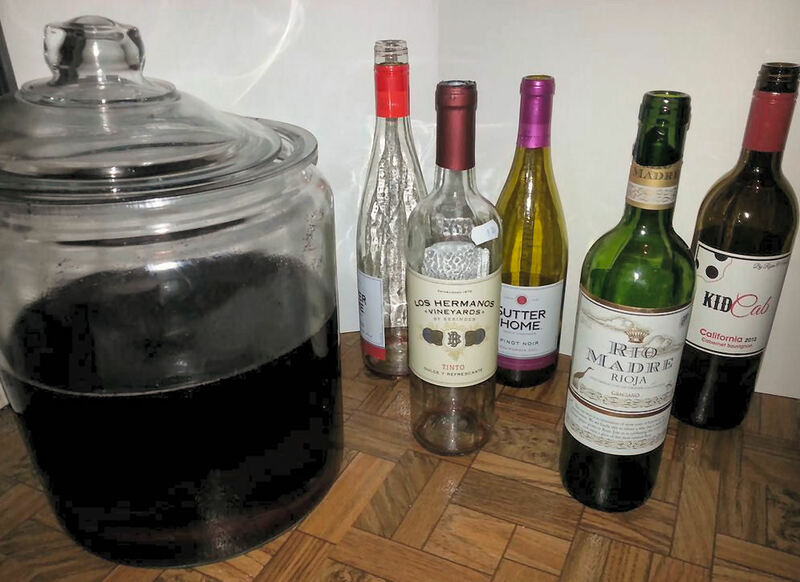 Pour in enough wine to nearly fill the crock. I just use assorted boxed wines or bottles of inexpensive – but not horrible tasting – wine, or on the rare occasion we leave a bottle open too long, I’ll add that, too. The vinegar becomes a little more interesting with a few different wines/varietals. Don’t use white or rosé, though: stick with red wines. 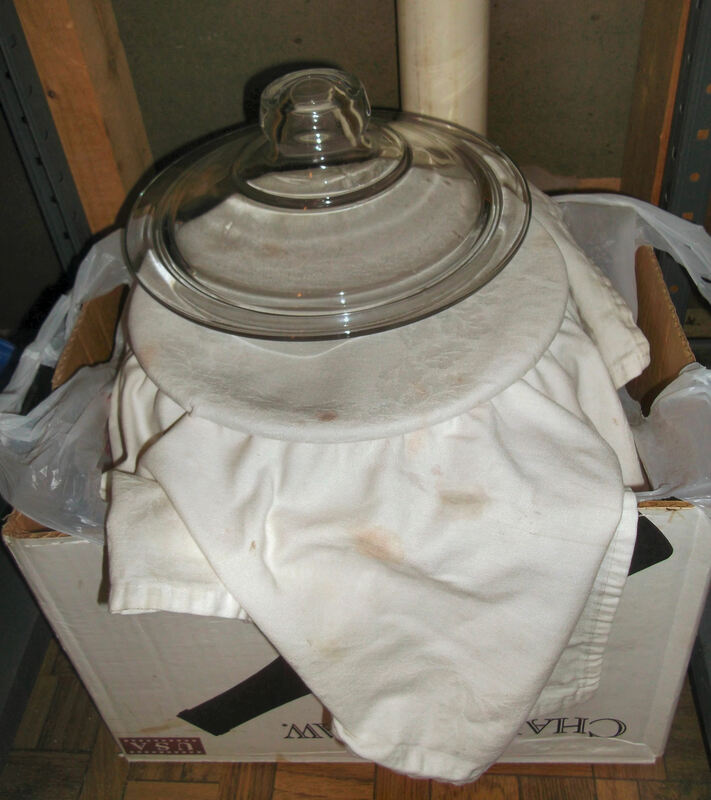 Cover the top or the container with a cotton dishtowel or cheesecloth to keep fruit flies and other unwanted visitors from falling in. (I secure my cloth with a large rubber band.) Place the lid on top but slightly ajar so Mother can breathe. Mother is a living, breathing organism, after all, and she needs oxygen to work her magic. I leave my lid about ¾ on, resting on top of the dishtowel. Because a box with handles is easier to lift than a crock of vinegar, I keep mine in a plastic-lined box. Place the container in a dark place at a consistent room temperature (60° to 80° F). NOTE: Keep the concoction FAR AWAY from your wine supply. Mother can spread microscopically through the air, penetrate corks and ruin good wine. As the mixture processes, it will first smell a little like acetone (nail polish remover) and then more and more like vinegar, so keep it somewhere where you don’t mind such odors. I started mine in our guest room until I realized that our guests probably wouldn’t appreciate waking up to aromas of vinegar, so I moved it to a little storage/junk room and keep the door closed when it gets too aromatic. And now…you wait. You don’t really have to do anything while Mother is at work except maybe check for fruit flies occasionally and strain them out. If you see a film forming at the top, that’s normal, but don’t strain that out: that’s just the Mother growing into more Mother. You’ll eventually see a solid, thick layer of Mother float to the top. Also, don’t strain or stir it. I did that with my first batch and I ended up breaking apart the newly-formed Mother, which got really messy when I went to use the vinegar and I had little bits of Mother floating everywhere. Just let it be. It will take about 3 months until the vinegar is “done.” I have read that when Mother floats to the top, it’s done, but smell or taste it to be sure. Another way to tell when it’s done is when it no longer smells like wine or acetone (nail polish remover), and instead smells – and tastes – like vinegar. The vinegar can be used straight from the crock, but you’ll probably want to strain it first and bottle it. 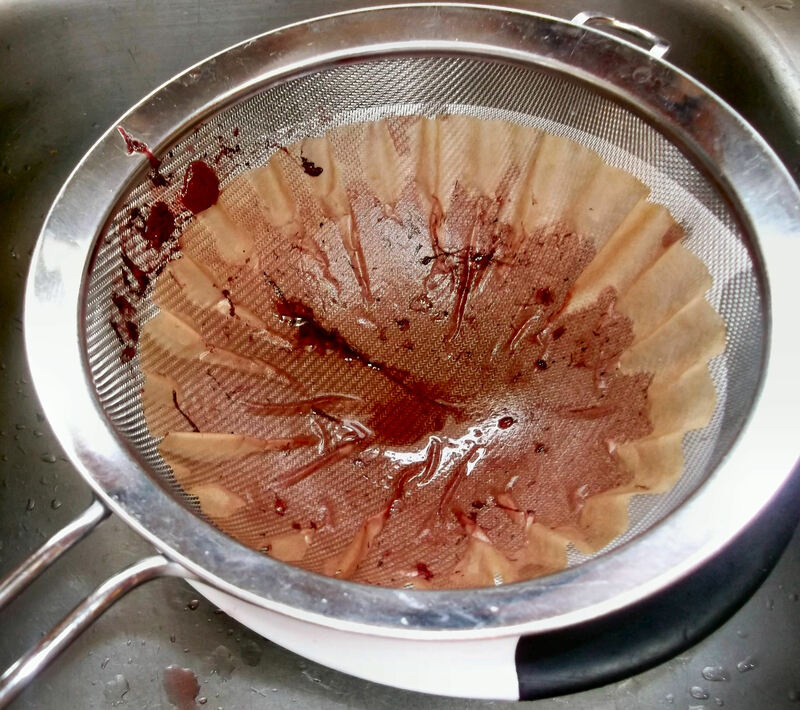 I line a colander/strainer with a coffee filter and pour the vinegar through that to strain out any tiny bits of Mother. While Mother is perfectly safe to ingest, any Mother present will continue growing in the bottle and can yield a pretty large blob if left for months. Again, perfectly harmless, but it may clog your bottle when you go to pour the vinegar. Optional step: I have read that the vinegar can be pasteurized by heating it to about 160° F, but I’ve never bothered doing this. While heating it may kill off any residual Mother, I don’t worry too much about it, and just strain it again when I use it if I see any solids in the bottle. Remember, Mother was pretty slimy and nasty, and so are the clumps of Mother you’re straining out. You may need to change filters a few times. 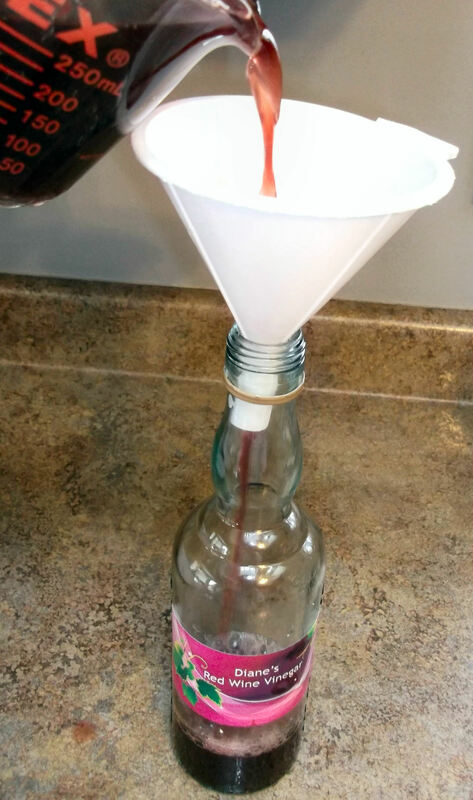 Pour the strained vinegar through a funnel into clean glass jars or bottles. It doesn’t matter what size or shape you use, just make sure to use glass containers with a good lid. 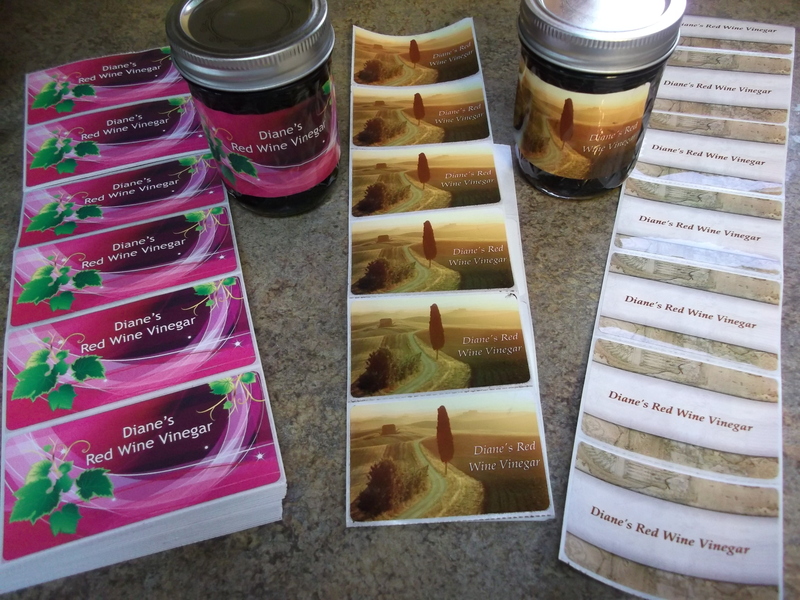 Design some fun labels for the vinegar, or if you have artsy friends like I do, have them create some for you. After bottling a batch of vinegar, leave a little vinegar remaining with Mother in the crock. You will likely notice that you have a lot more Mother than you started with. Leave it all in there or share some with a friend. Just add more wine to start your next batch. Enjoy! Note: The vinegar is highly acidic, so do not store it long-term in anything plastic. Also, immediately mop up any spills, especially on tile floors or granite countertops. I am happy to share some of mine when I have extra: just email me. Otherwise, look for a local beer-brewing or wine-making shop, or look online. I read that Amazon, LocalHarvest and Northampton Beer and Wine are good sources. 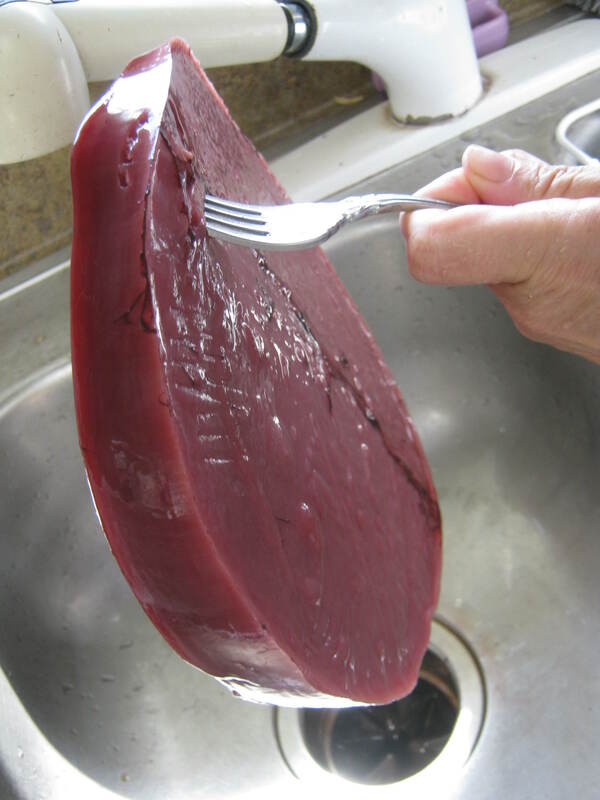 Just make sure you get the appropriate Mother for type of vinegar (red wine vinegar) you are making. 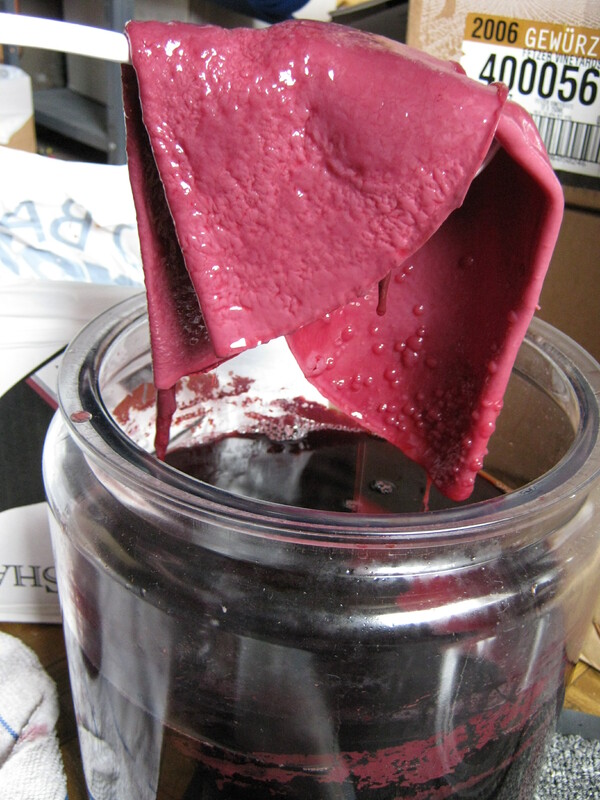 I started making my own red wine vinegar a couple of years ago. I haven’t yet had much luck starting a batch of white wine vinegar. Have you tried it? How interesting! I’m bookmarking this post! I made lavender vinegar, but it’s absolutely different thing from that recipe! Thank you for sharing! I hope I won’t waste the wine! St Gile’s Cray Carpet Cleaners Ltd.
As long as you get the right Mother and store it properly, it won’t be a waste. Good luck! Hi Diane, how would I go about preserving the mother to send to someone??? I’ve sent mother before in a glass jar along with some vinegar…maybe not an entire jar full, but enough to keep the mother covered. Then ship it Priority to get it there quick. Good luck! 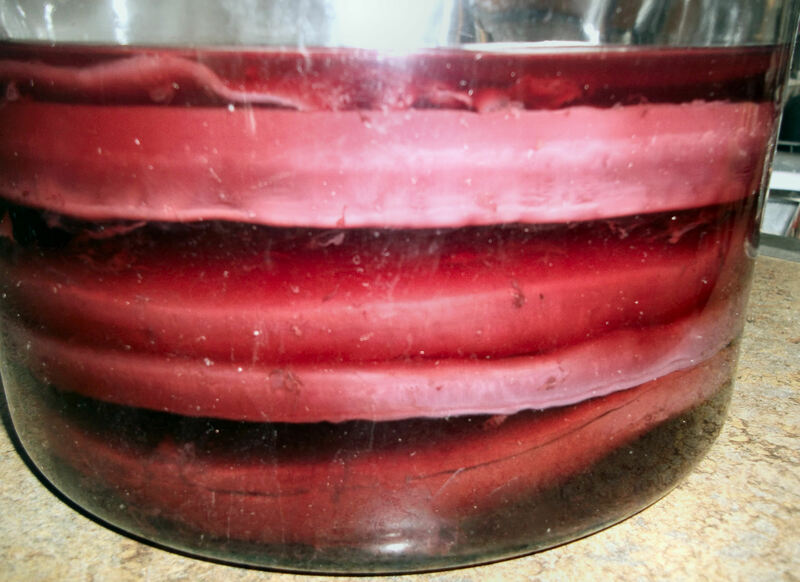 You have one of the best tutorials for red wine vinegar I’ve ever seen. Lately I have been researching it because it is def a project I’m interested in. Would you still ever share your vinegar mother? Just figured it could not hurt to ask! Yes, I would love to share my mother of vinegar. I’ve had to throw out so much as it’s grown and grown too big over the years.